Find the perfect present for Mum this Mother’s Day at Overgate. From a full day out with pampering and cakes to small Scottish themed keepsakes, we have something for every-Mum. Take time out and enjoy a facial massage or hand and arm massage using Kiehl’s luxury formula, followed by afternoon tea served with a glass of prosecco at Debenhams café and a VIP gift bag for mum to take home! £30 for 2 with £15 redeemable against purchases at Kiehl’s Debenhams on the day. Bookings must be made in advance by calling 01382 200539 or pop in store for more information. 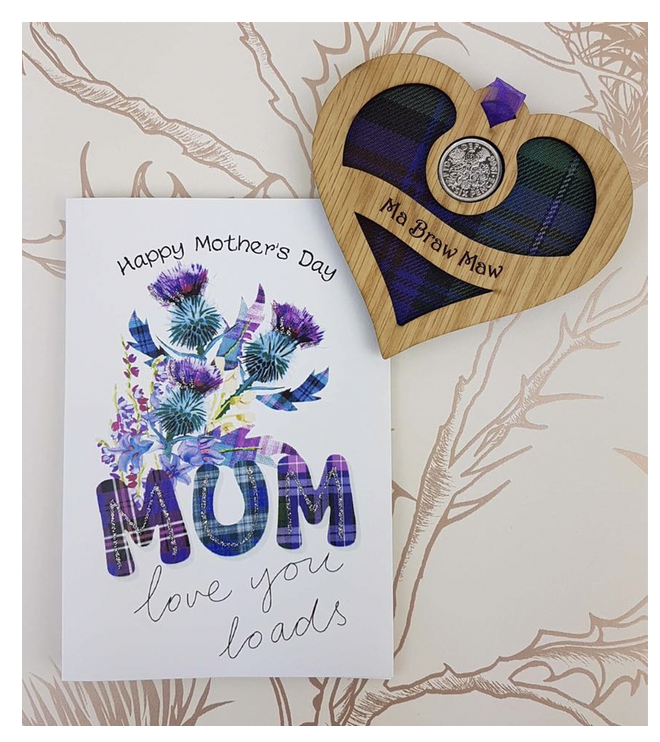 Looking for a traditional Scottish gift for Mum? Look no further than Overgate’s Little Thistle. With unique greetings cards and lucky sixpence designs, believed to bring wealth, good fortune and good luck to the keeper, among many other gifts to make Maw feel braw. If Mum has a sweet tooth (who doesn’t? ), the Millie’s Cookies Mother’s Day Floral Giant will be a winner! Two indulgent giant 28cm cookies sandwiched together with a layer of delicious icing, decorated with a floral design on top. Remember…. sharing is caring! Whether it’s an album of your favourite snaps together, or you get crafty with a sentimental scrapbook, Paperchase Overgate have everything you need to create a personalised keepsake gift this Mother’s Day. Do you have a Mum who loves to be pampered? Give the gift of restful soaks and luxurious showers. The LUSH ‘Happy Mother’s Day’ chocolate box style gift is full of treats that will leave her feeling pampered and smelling sweet. The vintage-esque, flowery design printed on 100% recycled cardboard and inspired by coral is the perfect keepsake for trinkets and chocolates before she even peeks at the array of indulgent products inside, waiting to scrub and soften from head to toe. Whether she loves pizza or burgers, fancy vegan options or just wants to feel good with the Feel Good Range, Frankie & Benny’s Overgate guarantee to have something every Mum will like. And what’s more, it gives her a night off cooking! Enjoy 2 courses for 13.99 or 3 courses for 16.99. Whilst there, be sure to try the new Spritz Range, all under 150 calories per drink but still with enough fizz and fun to make the occasion special. Remember to visit our Facebook page to enter our exclusive Mother’s Day competition before Monday 25th March, 12pm, and you could be our lucky winner of a LUSH Happy Mother’s Day hamper, a pamper day with Kiehl’s Debenhams and prosecco afternoon tea for 2 at Debenhams café!